Cricket is a 7 year old spayed lab who loves to play in the water. She was brought to us by her owner who found a worm coming out of her hind leg through a sore. 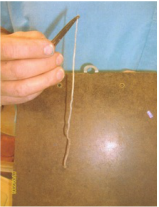 After being examined we found that the worm is called a New Guinea Worm. Cricket most likely ingested a water flea carrying the larvae of a New Guinea Worm. Once the flea is ingested the larvae is released into the digestive system. The larvae then migrates through the body from the digestive system to an area such as the lower leg. When the worm is ready to come out of the body it creates a burning blister on the skin. Once the blister comes into contact with the water the worm comes out of the skin ready to begin the cycle again. It can take up to a year from the time of ingestion to the time the worm actually comes out. The worm was extracted from Crickets leg, she was treated with antibiotics and is doing fine.